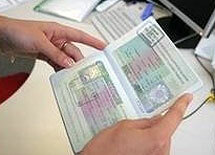 Vesna KSP » Blog Archive » Visa-free regime between Ukraine and the EU postponed the Krivoy Rog! Indecent words for foreigner Krivoy Rog! Visa-free regime between Ukraine and the EU postponed the Krivoy Rog! As the Deputy Director General of the European Commission responsible for External Relations Hugh Mingarelli that currently there are serious obstacles to the transition in relations with Ukraine on visa-free regime. According to Hugh Mingarelli, the parties must agree on the security of travel documents for the implementation of travel, and to ensure effective border management. "We also need to work together to overcome the illegal migration." – He explained. According to UNIAN , in turn, European Commission Vice-President Jacques Barrot said that identified four main topics of: document security, the fight against illegal migration, internal order and security, external relations. While Barrot said that the Commission expects to increase the role of Ukraine in the fight against organized crime, human trafficking and money laundering. Vice-President of the EC noted that the introduction in Ukraine of biometric passports would seriously facilitated the preparation of the transition to a visa-free regime. Ukrainian Foreign Minister Volodymyr Ogryzko after these consultations, expressed hope that the European Union will introduce a visa-free regime for Ukraine until 2012, as Ukraine and Poland will host the final of the European Football Championship. This entry was posted on Wednesday, December 4th, 2013 at 12:42 pm	and is filed under Other. You can follow any responses to this entry through the RSS 2.0 feed. You can leave a response, or trackback from your own site.